For the first time in her career, Delia Smith has allowed her name to be put on a product. Delia and the team at her newly-created Delia Online Cookery School, have joined forces with British manufacturer Alan Silverwood Ltd to create a new range of bakeware that not only fits Delia’s recipes but will also last a lifetime in the kitchen. Every one of the 100 recipes in the stunning new book Delia’s Cakes can be baked in one of the items from this unique range. With these products, the book, and totally free access to step-by-step video demonstrations of many of the recipes in the book, Delia has ensured that everyone from confidant competition bakers to complete novices have precisely what they need to achieve perfect results every time. Delia believes that along with the right recipe, baking success depends on using the right size tin. So for example, when Delia wanted to make a classic 7in round, 2 egg sponge sandwich, she found that whilst a 7in x 1½in deep tin will do the job, her recipe works best in a tin 18cm (7in) diameter and 4.5cm (1¾in) deep. Applying the same principle to every recipe in the new book, Delia worked closely with Silverwoods to find the optimum size, shape and style of tin to get the very best result. 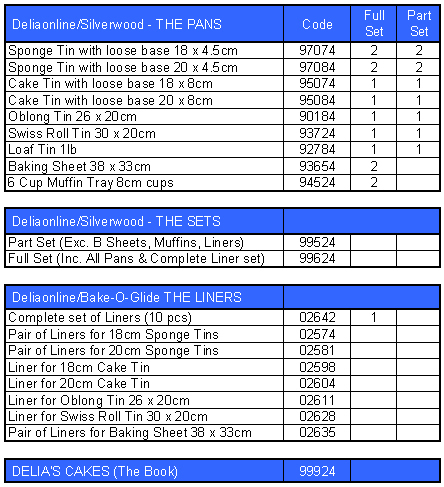 And the result is the new DeliaOnline /Silverwood range, available as individual pieces, or as a set. There are two sets on offer: the Full set and the Part set. For content details, see the table below, or click on the main menu to navigate to the appropriate page.